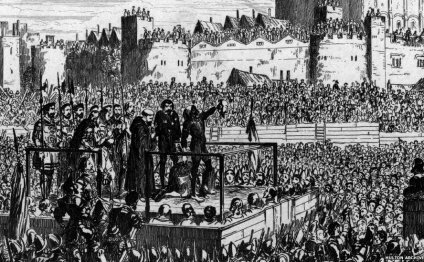 Some 70, 000 people suffered the death penalty during the reign of Henry VIII. This was a punishnent that resulted in your head being chopped off! The heads were sometimes placed on spikes along London Bridge or other places. Beheading was considered less degrading than hanging, and it usually killed more quickly. Noblemen (rich) who commited crimes wre more likely to be beheaded than hung. For attempting to murdering someone you could be boiled alive in a big bowl of hot water. Many towns had a whipping post. The victim was chained to the post, stripped to the waist and whipped. You could be whipped for stealing a loaf of bread! Hot irons were used to burn letters onto the skin of offenders hand, arm or cheek. A murderer would be branded with the letter 'M', vagrants with the letter 'V', and thieves with the letter "T". The pillory was a T shaped block of wood with holes for the hands in the crossbar of the T. The person being punished would have to stand in the device in the middle of the market to be ridiculed by passersby. Stocks were used in the same way as the pillory, except that with stocks, the feet were bound. The stocks were a block of wood with two holes for your feet to go in.You were put in the stocks for selling bad meat or bread. Local people threw rubbish and rotten eggs at people in the stocks. You could be put in the stocks for not wearing a hat on Sunday! Accused witches were dunked into a river, to see if they were innocent or guilty. If they floated, they were considered guilty and burnt at the stake. If they sank, they were innocent but died anyway, by drowning. Either way, they perished. Some people who stole things from shops had there hands cut off. This was a punishment for public drunkenness. The drunk was forced to don a barrel and wander through town while the villagers jeer at him. Holes were cut in the barrel for the person's hands and head, causing it to become like a heavy, awkward shirt. Execution Ballet (piano) "the Tudors"
Tudor Petrov-Popa (born 1963), like Andrei Ivanţoc, is a Moldovan-born Romanian politician, arrested in Tiraspol in June 1992 by the Transnistrian separatists.